Sathuranga Vettai is a relevant, thought-provoking film revolving around a sharp con artist who cleverly exploits our secret desire to make easy money through the most fantastic scams, says S Saraswathi. Man’s desire to make a quick buck or get a good bargain is such a deep-rooted inherent characteristic that he can easily be waylaid by the most preposterous schemes. The mere thought of Rs 5 lakh miraculously turning to Rs 15 crore overnight makes him drool, forgetting every intelligent and rational thought. Director Vinoth has explored this weakness in his debut venture, Sathuranga Vettai, released by Thirrupathi Brothers. The protagonist in the film, Gandhi Babu (Natraj) is a skilled conman. He dreams up ingenious scams and executes them perfectly. He sells ignorant people ordinary snakes claiming that they are exotic and will fetch crores in the international market. He promotes a non-existent 'multi-level marketing' company with its controversial chain referral schemes promising a BMW car within the year. And the climax has him pulling off ‘the rice pulling scam’, one of the most high profile scams of recent times. About 40 minutes into the film Gandhi Babu is arrested and multiple cases filed against him. But the money he has scammed over the years comes to his rescue and he is released. He is not in the least remorseful and continues to manipulate everyone. He believes that if a person is foolish or greedy enough to be duped, then the person is to be blamed. He argues that every election voters are conned by the candidates who promise them the moon, but never come through. Banu (Ishara Nair) is from a poor family. She comes to work for him and falls for his charms. Despite having a soft corner for her, money is Gandhi Babu’s first priority and he abandons her. The director keeps us hooked with a steady supply of popular, well-thought-out scams, but fails to do away with the predictable melodrama. Even the antihero needs to have a sympathy arousing flashback. Gandhi Babu has a tragic past, his family is taken for a ride and he is left with no money to even cremate his mother. And, of course, towards the end, it is mandatory for him to turn into the hero and have a change of heart, and surely his past sins come back to haunt him. But despite these clichés, the film is totally worth it. Watching these absolutely bizarre scams on screen, you have a good laugh, conveniently forgetting that such instances are an everyday occurrence in our country. As the protagonist rightly points out, if we appeal to the basic sense of greed in man, then making money can be very simple. Natraj is totally convincing as a clever swindler. He is equally comfortable in suits and the traditional dhoti and lungi, fooling everyone from naïve villagers to the well educated. He has the gift of the gab that is strengthened by Vinoth’s well written, thought-provoking dialogues. Cinematography by K G Venkatesh and Sean Roldan's background score add to the drama. 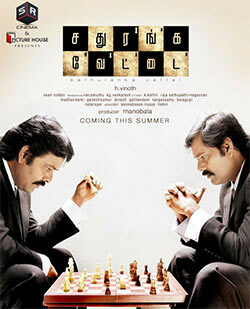 Director Vinoth’s Sathuranga Vettai is a relevant and intellectually stimulating film. Watch it to learn how our vulnerability is easily exploited by clever con artists preying on our desires.